Devoted Quilter: TGIFF - The 'Not Quite a Finish" Edition! Welcome to Thank Goodness It's Finished Friday! If this is your first time visiting me at Devoted Quilter, welcome! Unfortunately, I don't have a finish to share (whoops!). When I signed up to host TGIFF this week, back in November, I thought for sure I would finish one of a few different projects I have on the go so that I could share it. But all those other projects have been put on hold for the moment as I rush, rush, rush to try and finish a wedding quilt. This wedding came rather sooner than I was expecting. The couple have been engaged since sometime last summer, but I was expecting a spring or summer wedding, so I planned to start the quilt after Christmas, thinking that would be plenty of time. Then, just before Christmas, I was told the date had been set - February 7th! I still couldn't start the quilt until after Christmas, because I was working on the boys' ornaments, so I considered abandoning the whole idea. I really wanted to give them a quilt, though. It's what quilters do! So, two weeks ago (with three weeks to go before the wedding), I finally settled on a pattern, picked out my fabric and started. At that point I figured I'd be doing well if I had the top finished to show the bride and groom, then I'd bring it home to finish it. I was way off - in less than a week I had the top finished! I've been feverishly working on the quilting since then and I count each stage that I finish as a little victory, since it's one less thing that will need to be done after the wedding. Stage one: the stitch-in-the-ditch work around the white print squares that form the 'chains'. To be honest, I find stitching in the ditch to be really boring, but sometimes it has to be done. I do it fmq-style rather than using my walking foot, so I don't have to turn the quilt. I noticed with this quilt that I'm finally getting better at it. There were fewer wobbles out of the 'ditch' and when I did wobble I recovered faster. Good to see I'm making progress. Stage 2: FMQ in the white print squares. I'm sure this design has a name, since I see it quite often, but I'm not sure what it is. It reminds me of the cathedral windows quilt block and I quite enjoy stitching it. Last Sunday I was fighting a cold (still am, actually) and I really didn't have the energy to do much but sit. Thankfully, quilting is a sit-down sort of activity, so I spent pretty much the entire afternoon stitching these blocks and by supper I had them almost finished. 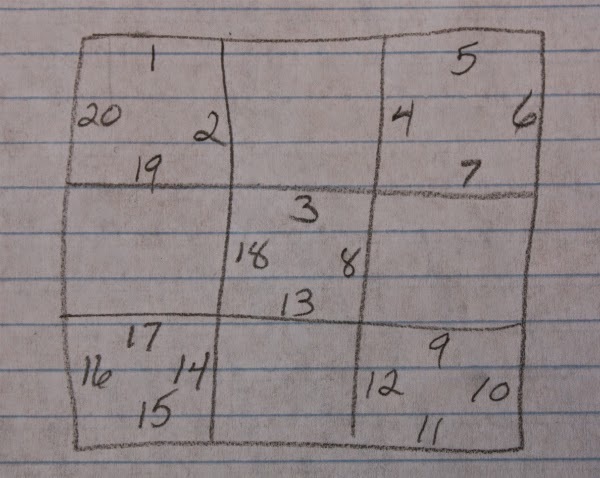 I made myself a little map to follow since I don't stitch these lines one square at a time. I could do an entire nine-patch without stopping if I followed my map. Actually, I tried to start at the corner where two nine-patches meet, so I could stitch one and then move right on to the next. It worked really well, except that when I finished and checked it all out on the back I discovered I had somehow missed three lines in one section and two in another. Oops! Once they were done I could check off stage 2, with almost two weeks still left until the wedding. 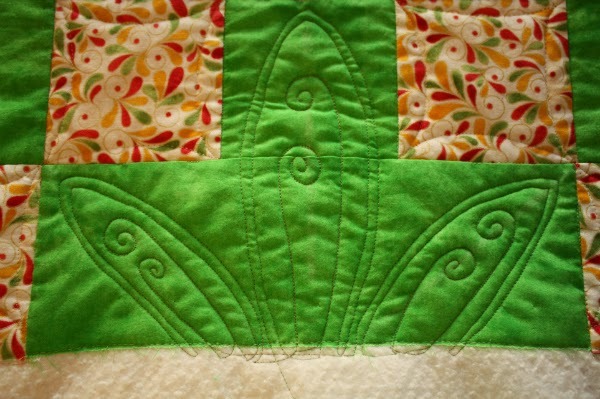 Stage 3: flower motif in the large green sections. I planned the quilt so it would come together quickly, so the blocks are 12". That means those open green sections are a huge 18" at their widest points! Originally I thought I would fill them with feathers, probably in a wreath design, but I really can't make feathers look nice at the size. I can't make them go around in a circle either. Don't know why, but they look awful! Lots more drawing practice needed, I guess. I found this design in Judi Madsen's Quilting in Wide Open Spaces, and decided it would be perfect. Of course, Judi stitched hers in a much smaller area, so I was a little nervous about the first one. Mine is much, much wonkier than Judi's, especially if you look closely, but if you stand back I think it looks ok. 1 down, 16 more to go. Here you see my fancy marking tools that I've been using to give myself reference points for each petal. I love the partial flowers on the edges - they stitch up so quickly. In fact, I enjoyed those partial flowers so much I took a break from doing the full flowers and stitched all 12 of the partial ones - stage 3a finished! So, that's where I am now. Stage 3 is still underway (I now have 6 of the 17 full flowers finished), and there is still a week to go before the wedding. My parents are going to be visiting for most of that week, though, so I'm not sure how much quilting I will do. But, I'm soooo close to finishing that I may take a little time each day and try to get it done. It would be amazing to actually have it done in time for the wedding! So, that's my 'not quite a finish'. Let's see what you have to share this week! Be sure to visit a few other links and congratulate them on their finishes. We all love comments and compliments! Oh, that is so beautiful. What a great job you are doing! Your quilting will make this quilt very special. Isnt' it fun to try something new?! Oh, that looks great! Keep on going, I cheer you on! Thank you for hosting TGIFF. It's going to look beautiful! Thank you so much for hosting! 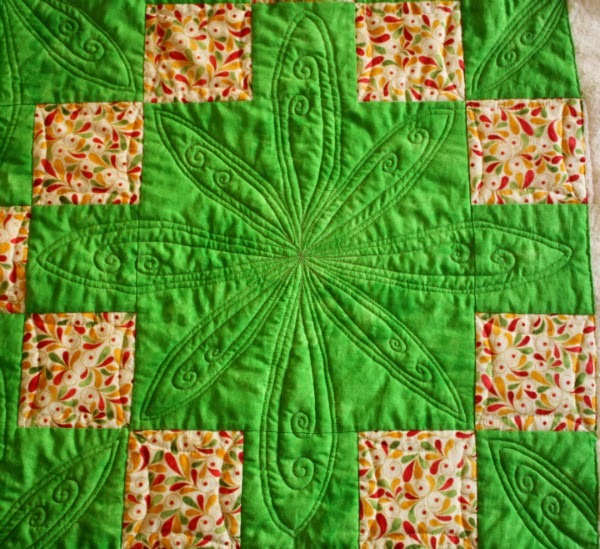 Your flower quilting in the green centers looks fabulous, Leanne! You chose the perfect motif for showing off the background and making it truly special. This is going to be an amazing wedding gift. Good luck! I think your quilting looks great! I enjoyed seeing the process of your quilting. Which btw looks fantastic! Thanks for hosting today!! Congrats on hosting TGIFF and great work on your quilt. 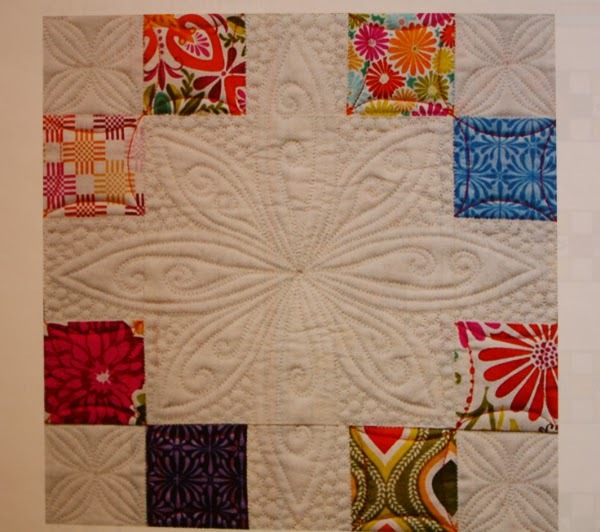 I love the intricate design you are using, it looks great and will give the quilt so much pop! Your quilting looks great! I love the bright green! I love seeing your in progress quilting. 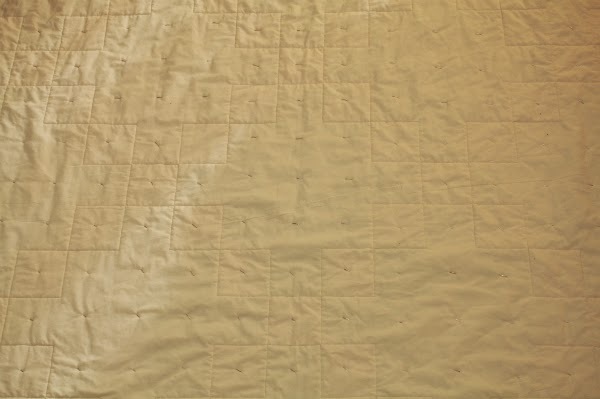 I used that curves in a square design on my last quilt. I called it orange peel, but I don't know if that is right. You are making great progress on this quilt, Leanne! 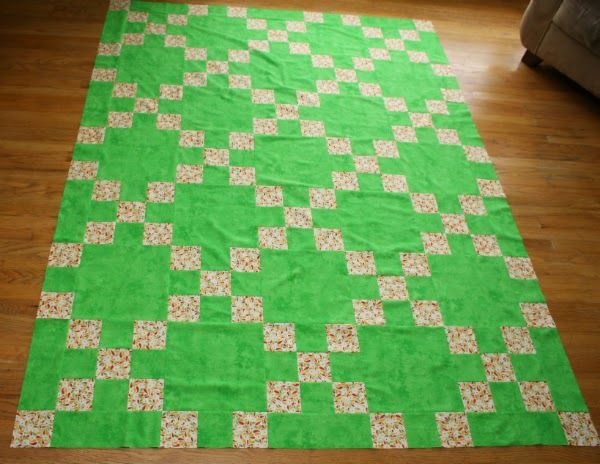 A great pattern for your blocks - your quilting looks GREAT! Absolutely stunning! 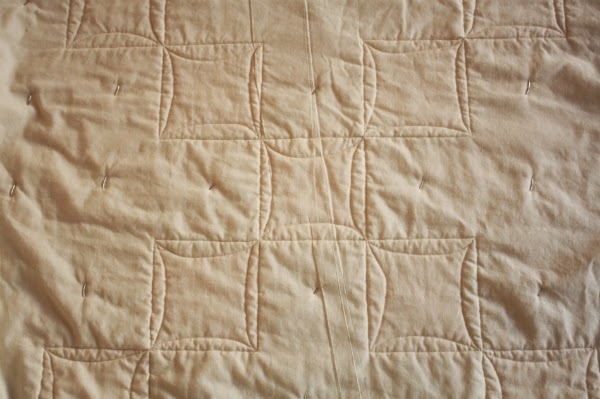 I just love the quilting! Thanks for the map idea--I always plan a path, then get confused in the middle and skip something. You may just get it finished in time! 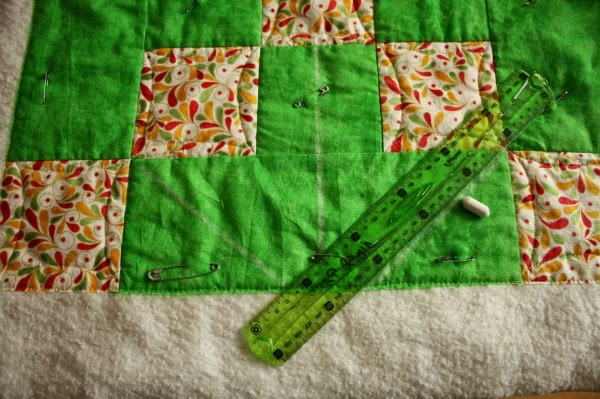 I love the design inthe large green space--saving time at one end (piecing) makes for taking more time at another (quilting); there are no real short cuts! Wow, Leanne the quilting is stunning. It will be a great quilt. Your flower quilting looks beautiful! It's better then I could do. I would have to practice and practice! Hope you are able to finish the quilt! Fingers crossed for you. I'm running another fabric giveway, and you are welcome to enter!